Custom 5-bedroom, 4-bathroom home rests on 18+/- acres of income-producing farmland minutes from Selma. Approx 11-12 acres of almonds on drip irrigation starting its 4th leaf & approx 5-6 acres of producing Thompson Seedless vines. New well (10'' casing) & pump complement CID water. Fenced & gated yards include 3-car carport attached to large 2-car garage in addition to covered parking for farm equipment. 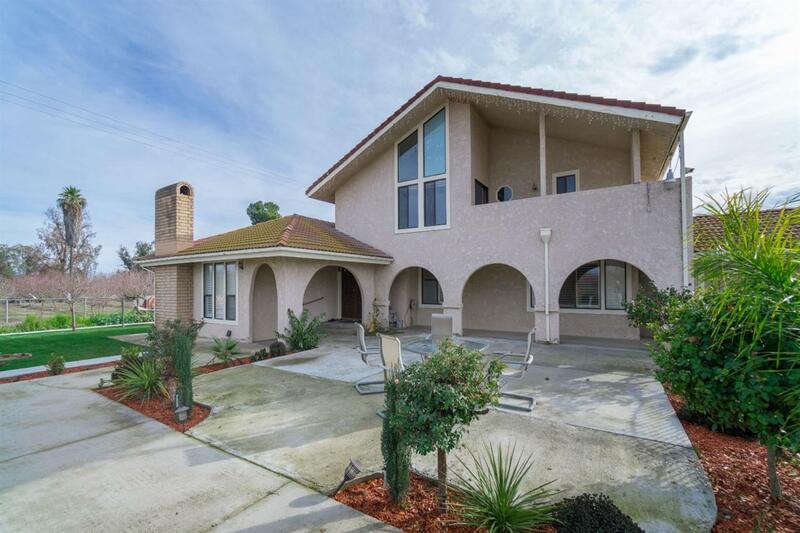 The home boasts recent gorgeous hardwood floors in addition to tile entry & baths. Kitchen includes granite counters, center island with vegetable sink, breakfast bar & nook. Formal dining off the kitchen connects to step-down formal living room with fireplace. Large family room with wet bar and canned lights has step-down area with fireplace insert for relaxing. You will be comfortable with 2 HVAC units, a whole-house fan & ceiling fans in each room. Two master bedrooms, wrap-around balconies with views, lots of storage & pool make this a great place to live! Listing provided courtesy of Myron Emerzian of C-21 C Watson Real Estate Inc..